They understand the power of diversity. They see learning as fun. They marinate on the "edge." Are you seeing this in your classroom? How would you design a game or assignment to bring this out of your students? PBS Extended Interview with John Seely Brown - New Learners of the 21st Century. Out of all we are doing this week, this fascinates me the most, because of what I see as a continuous loop of transfer of skills back and forth from reality to gaming and gaming to reality. I was focusing on the augmented reality and its skills transfer to real life experiences and problem solving when I watched the PBS Extended Interview with John Seely Brown - New Learners of the 21st Century. He discussed how surfers get better, how they share knowledge, how they are using technology and thrive on change to get better. I do have to admit surfing is more fun than discussing how many words each character in Chaucer’s Canterbury Tales spoke and how the number is significant. Those in the games we are talking about this week have been in real-life committee meetings or planning events, they have been leaders, followers, organizers, instructors, students, developers, coordinators and it all transfers. None of us like to do what we can’t do well, so we need to remind ourselves and our students, when we want them involved in an Augmented Reality Game for example, that they have transferable skills, it isn’t going to be 100% new to them and that we have faith in them that they will be ok and do well. They may need a guide. . . In my own classes when taking students into a game, I have done well by paring a gamer with someone who isn’t and had them work cooperatively. We did this with WarHammer. One watches for a while and the gamer explained everything they were doing, then the gamer turns over the controls and helps by verbally guiding them. Finally, the new player will want their own character to play and their own adventure, and may tag along in the game with the gamer then finally move off on their own. I contend that private industry workplaces are easier to embrace the change (brought on by intense competition as well as innovations and technology). Or as we said, when I worked in high-tech, “You snooze, you lose!” I contend that in education where change is traditionally slow and measured, it is a challenge to bring on board administrators and policy makers when the status quo has served them so long and so well. However, we are making headway, this MOOC and all who have joined us here are instruments of that change, we are the ones that not only may be fighting a war on a distant planet with dwindling supplies, we are also the ones saying there is a new and exciting way to engage our students, let me tell you all about it! I am “augmenting the reality” of my students in about a week, we have studied cultural artifacts and the significance to culture (Cultural Anthropology) and we are going to a big auction of estates, storage lockers, dealers and private consignments. We will go through all the items for sale looking for interesting artifacts that tell us about the people who owned them. We combine our knowledge base, share finds, discuss possible uses for odd objects, put someone's life story together from a discarded picture album. [that relies a lot on knowing cultures/styles/cars/etc.) from different periods of history. Not exactly “garbology” Garbology as a College Class but close to it. Then they are using their smart devices to look up what they have found and telling each other about it and sending the pictures directly into the class shell in a discussion. I have prizes, for things like something from each decade, the souvenir from furthest away, the most embarrassing family photo, the oddest item, the oldest electronic game/technology... Last time a student found a Nixon Plate, it was a little odd, bought it for $5 and sold it on eBay for $205. True story. Of course! The WoW example is great...you must work with other players/characters that have various qualities/traits, OR you push the limits and attempt an Instance (dungeon) with an unorthodox, sometimes asinine, group configurations (i.e. no Healer, Tanks only?). An initial idea I had was modelling WoW's "profession" system, but instead of choosing actual Roman professions, students' "expertise" would be in a topic of choice about which to write/speak in Latin at various points of the game. In other words, one student may be really into gladiators, while another is interested in attire...they would be learning key topical vocabulary and cultural traits independently. Perhaps this characteristic of "the power of diversity" can be as open as requiring certain assignments to include viewpoints from students/characters from 3 or 4 different expertise areas. That may help to eliminate the tendency for friends to all work together on the same topic (you know that group in the corner who always come up with eerily similar responses...). Someone mentioned having to look up "differentiated instruction" - this is good. I think it's perhaps the most important aspect of planning/teaching. The idea that students can choose what to focus on (without the curriculum being thrown into chaos) and HOW to complete certain assignments (formats, media, etc) is at the root of differentiating. The power of diversity can be increased if given proper avenues in game design and lesson/unit planning. I use this idea with sending students out on self-guided field trips looking for "cultural artifacts" (anthropology), see earlier post this forum. It does have them cooperating: I also remember doing this with my granddaughter (Grandma's Pre-School) with Whales -- explored in many ways and when she was in 3rd grade with Vikings (museum, all the activities - visited a real swordmaker and armorer I know, made chain mail, got to touch all the artifacts he had, watched film, drew things, threw runes). I really think you are on the right track with what you are planning. Cui prodest? We all are, especially the students, teachers need to have fun teaching and students need to have fun learning. . . gamification... go for it. It strikes me that you could try to take a page from some of the games that use other languages as the magic or fighting system a la Nihongo Master. To expand a little on grasshopper98's suggestion, "I use this idea with sending students out on self-guided field trips looking for "cultural artifacts" (anthropology)", perhaps students could be sent out to document something completely in Latin. For example, the game could be that they are sent undercover back in time to get clues. They can't speak or record in English because that would attract too much attention. Each student could choose their form of documentation, including writing, video, audio, etc. I've been witnessing some of these dispositions in my First-Year Comp. II class this term. We're using immersive role play: each student has developed a persona based on predetermined roles (cold case detective, psychologist, or journalist) and works in a guild with others who share their role to investigate/analyze the texts we are reading. After consulting with their guild, each student creates an artifact about the case for their character's blog. I did not prepare the students for the challenges of the class through direct instruction at all; I simply challenged them to do it and they've learned as they went. Over the course of the term, their work has become increasingly creative and complex in scope, creating an implicit challenge for everyone to improve the quality of their artifacts with each successive blog post. For their final project, students are having to partner with someone from another guild and combine their expertise on a previous case in order to create a set of interactive media. Again, I have not provided any specific guidelines or direct instruction; I simply provided them with a list of creativity resources that they might find useful. The level of energy is unbelievable; the students are discussing and debating the texts in more detail and with more enthusiasm than I have ever been able to coax out of students through Socratic questioning or guided inquiry. I'm not sure if it's the game-like design of the class, the gamer disposition of the students (they're all gamers of varying levels and degrees), or both. But it's certainly a different type of learning. "The ability to travel time is inevitable...perhaps even possible in your lifetime. Just as Virgin has planned for the first space-flight, so too, will travel in history become a recreational passtime in the future. Not everyone can go, however, and much like our driver's license, you must go through extensive training in order to become Time Traveller Certified." I really like the expansion you did and I think I can steal an idea from you! ;) That would be applicable to Cultural Anthropology. I might be able to have them pick a culture and assemble what they would need to take (back in time) to fit in. You got me really thinking as I am going to re-do my Cultural Anthropology classes for Fall. . . Time to try something new. Looks like the idea of time travel has taken off! It definitely offers some advantages. It allows for suspension of disbelief when you say something like, "You can only speak Latin." To expand a little on the idea MagisterP had, regarding sending people back in time in order to ________... It could also be that the organization is trying to track where others were sent back in time by examining subtly changed primary source documents for anachronisms. I also like Grasshopper98's idea! "Back Your Time-Travel Kit! You're going to be going back in time today as a [profession] in [time period]. What do you need to get through your day?" I have had some good experiences that are at this point are just in my face-to-face with time travel, I teach in a computer room so students are three to a row in two columns, I call each row a pod and they have "pod mates." I tell them something has happened and only all of us in the class, our parents, grandparents, children and grandchildren have survived, we are in Colorado 13,000 years ago, we do have our memories and anything we might be wearing or carrying on our person. Now how do we survive? Who has what knowledge to share, what about religion, social structure, political organization. That there are similar pockets of transported people in each of the seven western US states, that is all that is left of the world. How do we deal with the other groups that we will meet in the future. They really get into this project. Works for a 10 week class where we have two hours. They do use the internet to look up climate and environment and what animals were here, what plants. . . It does make them realize how much we rely now on information at our fingertips instead of oral tradition. One of the most interesting statements was "As we replace our clothes or other items, we must keep them, they are artifacts." For those that don't know Colorado, we have a nice cache of 13,000 year old weapons found near Boulder when someone was making a path in their backyard. Check it out. 13,000 Artifacts found in Boulder The do watch this video to see what a tool kit looked like. It was assumed that we would find this cache. I really like the idea of a time-traveling ARG. I like time travel in general, so that's not really much of a surprise. When it comes to teaching, this has an almost limitless array of possibilities. Since you would need to "blend in," you would need to learn the language, attire, and culturally acceptable actions for the time and place you were visiting. There are a lot of different goals a time-traveler could have as well. I'm reminded of "Where in Time/Where in America's Past is Carmen Sandiego" where the infamous thief and her crew steal their way across time. Recovering artifacts is definitely a tried-and-true plot device for such things. Oooooo, there you go. I was looking for some "grammar puzzles" to use in my teaching because, quite honestly, it is not necessary to understand grammar in order to communicate effectively (I would argue that MOST of the population has no idea what grammar exists in their native language). There are, however, obvious benefits to learning about grammar, but I think context and delivery of such instruction is paramount. Inspired by your post, I can imagine puzzles that are more than just the simple drill of "find and correct the 10 errors present in the following paragraph." Instead, the discrepancies would/have result(ed) in dire changes to the narrative. The other possible benefit is that students might have to identify where a "fragment" of Latin prose came from. It might also be a matter of identifying incorrectly conjugated verbs (from someone trying to ineptly change the past). Or they could read (or watch a video) about someone interviewing someone else in Latin and determine if that person is a spy from the future based on their sentence construction. I've no idea what level of Latin you teach, though. I am reminded of the action where the insertion of a comma, changes the story or the intent, maybe it could be an interactive fiction where the student chooses at a pivotal plot point (1) Larry walked on ahead or (2) Larry walked on a head. The choice of the correct Latin grammar would either throw you into a scenario that lacked pleasantries or got you to a new scene with new activities. I am willing to try anything. I did "float an idea" with my anthopology class this morning, got shot down. 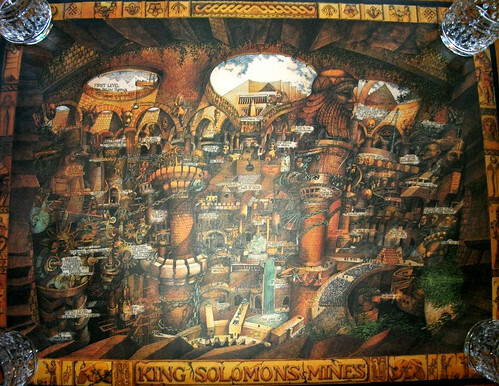 LOL I had a 1000 piece puzzle that held clues and sayings that was historically accurate, it was on King Solomon's Mines. Since for some reason the college has put all three of my anthropology classes in the same room, (unusual) I figured I could have a table and then for each five pieces they put in place they could take a 'gold coin' The class with the most gold coins would win something. They could do it on breaks, before and after class. They all said "Na, doesn't sound like fun." I was so excited to start with! Puzzle wasn't cheap, was $55 new, of course I got it at a thrift store for $0.50, but still, why were they not excited? Was it because there was no computer application? What the hey?